Discover a relaxing Pillar Point getaway at this 3-bedroom, 2.5-bathroom vacation rental house. With accommodations for up to 6 people, this supremely located 1,600-square-foot property sits right on Lake Ontario. You and your guests will love the wrap-around porch, magnificent lake views, and cozy amenities in this beautiful 'Americano' Victorian home! A beautifully gardened walkway welcomes you to this classic home in upstate New York. Complete with all the comforts of home, this is sure to be the perfect Lake Ontario vacation for you and your travel companions! The open living room and dining room is perfect for relaxing on a lazy afternoon. Curl up on the couch or reclining armchair and keep warm in front of the fireplace. Cook up some mouthwatering creations from the home's fully equipped kitchen. You and your guests can gather around the 4-person dining table for some quality time over dinner. Most of your time is sure to be spent outside relaxing on the home's wraparound porch or taking advantage of the outdoor gas grill and fire pit. Enjoy an afternoon drink outside with breathtaking views of Lake Ontario! When you're ready to retire for the night, head up to the master bedroom where you'll have a revitalizing night's sleep on the luxurious king bed. Those staying in the second bedroom will enjoy a queen bed, while the third bedroom offers a king pullout bed. This lakefront vacation house offers its guests an unbeatable location! Just steps off your property, you can take in the wonderful lake views or jump into the water for a nice swim. Take a short drive to nearby restaurants and shopping. Spend the day out on the lake with by renting a jet ski or boat, and then grab some gourmet pizza at Goodfellos for a nice night out. For fun day trips, make your way to Pillar Point or Alexander Bay, or book a ride with Uncle Sam's Boat Trips! A historical experience isn't too far at Bolt Castle and Bonnie Castle, and a fun Canada experience also isn't too far from the home! Travel to Kingston by ferry from Cape Vincent and explore Ottawa, Gananoque and Brockville while you're there. Entertainment abounds in upstate New York, so take a day trip to Finger Lakes, Cooperstown (where you can see the baseball hall of fame), Saratoga Springs and Howe! For additional day trips, you can check out Caverns, Old Forge, the Adirondacks Mountains, Darien Lake Park, and the Clayton Boat Museum and Lake. 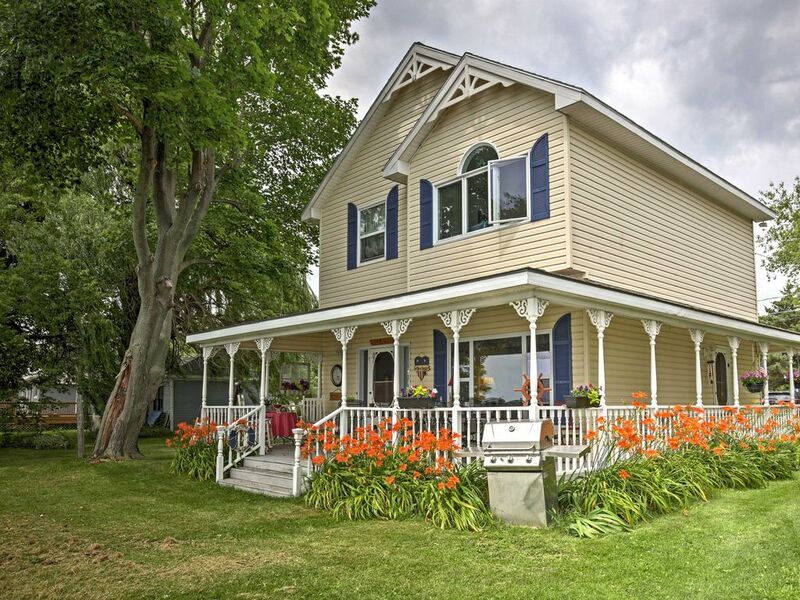 No matter how you spend your time, you're sure to have a relaxing and revitalizing vacation while staying at this wonderful Lake Ontario waterfront home! - Beautiful Pillar Point location - Lakefront property with easy access to restaurants, shopping, swimming, boating, hiking, and much more! The house was comfortable and charming. View of lakefront was beautiful. We had a very pleasurable experience. Thanks to Cynthia for her great instructions and kindness. Hope to return. My husband and I just spent 12 days at the cottage on pillar point. The view is outstanding. The front porch is 20 feet from the lake. We were lulled to sleep every night by the waves. It is the most quiet and relaxing place we have stayed. The house is very comfortable and clean. it felt like home. We spent most of our time on the porch, when we weren't out. It is conveniently located. We took the cape vincent ferry, visited Kingson, in addition to other places. We would definitely go back to pillar point.